The New York Giants and St. Louis Cardinals had scheduled a doubleheader to close out the 1904 season at the Polo Grounds.1 Unfortunately, a series of events made this a day to forget. The Giants lost both games. 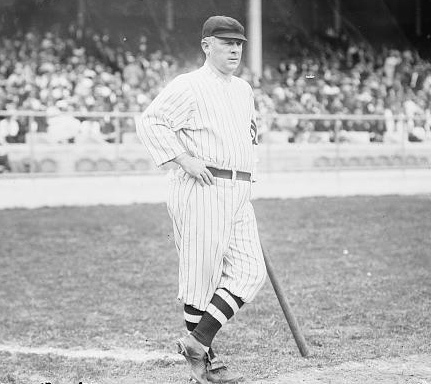 Despite an historic performance by Sam Mertes, New York dropped the first game due to “poor fielding and the wild pitching of (Joe) McGinnity.”2 About two thousand spectators had come to the ballpark, and during the second game, there was “a display of rowdyism which might have developed into a good-sized riot but for the quick manner in which a handful of policemen handled the ringleader of a much-wrought-up mob.”3 However, the real problem turned out to be the Giants players, who forced the umpire to cancel the game and give the victory to the Cardinals via forfeit. McGraw was absent from the field this day, so utility player Doc Marshall was acting manager. 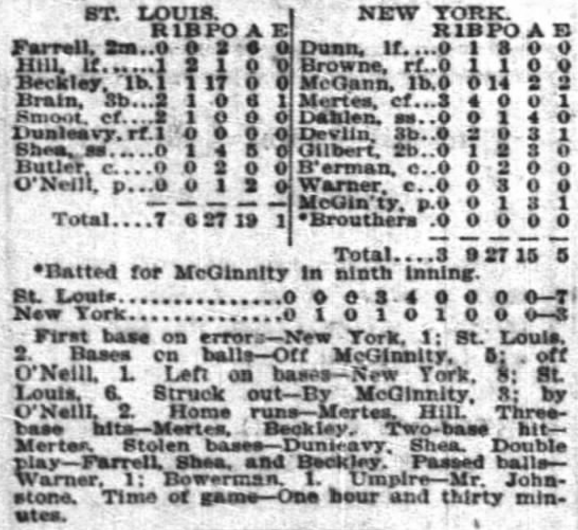 He sent 35-game winner McGinnity to the mound in the first game, opposed by St. Louis lefthander Mike O’Neill, who was aiming for his 10th win of the season. McGinnity had won 14 consecutive games at one stretch during the season. The scoring started in the second inning. Mertes led off the frame for the Giants and homered over the right-field wall. That was the game’s only run until the top of the fourth, when Cardinal Jake Beckley tripled to right to start a rally. McGinnity walked Dave Brain, and then both runners advanced on a passed ball. With the score now tied, Homer Smoot also walked. Jack Dunleavy grounded out, putting runners at second and third with just one out. Danny Shay foul tipped an offering by McGinnity, and the ball split New York catcher Jack Warner’s finger, forcing Frank Bowerman to enter as a defensive replacement. The next offering by McGinnity was also a passed ball, and Brain scored the go-ahead run for the Cards. Shay followed with a single to right, scoring Smoot. McGinnity then retired John Butler and O’Neill, but he had allowed three runs on two hits, two walks, and two passed balls. Mertes led off the bottom of the fourth with a triple to center. He then scored on Bill Dahlen’s sacrifice fly to the left fielder Hugh Hill. The Giants had cut the Cardinals’ lead in half, but St. Louis answered in the fifth inning for four more runs. With one out, Hill homered into the right-field bleachers. Back-to-back singles by Brain and Smoot started another rally, which was assisted by a comedy of errors. Dunleavy hit a ball to McGinnity, but his wild throw to second allowed both Brain and Smoot to score. Mertes fielded the errant throw in center and tried to get Dunleavy, who was running to third. The ball went wide, and Dunleavy scored. Three unearned runs scored on one play. Mertes doubled and scored in the sixth, giving New York its third and final run of the game. McGinnity settled down somewhat and held the Cardinals scoreless after the fifth. O’Neill was effective, blanking the Giants the rest of the way, although Mertes did single late in the game to complete hitting for the cycle. The final score from the first game was St. Louis 7, New York 3. The Giants had put nine hits on the scoreboard, but managed only three runs. The Cardinals took advantage of sloppy fielding and five McGinnity walks to score seven runs on just six hits. Both Dan Brouthers and Jack Dunn played the final games of their career in the opener of the doubleheader. Brouthers came in to pinch-hit for McGinnity in the bottom of the ninth inning. At 46 years old, it was only his second game of the year, and he had been out of baseball since 1896, when he played for the Phillies. 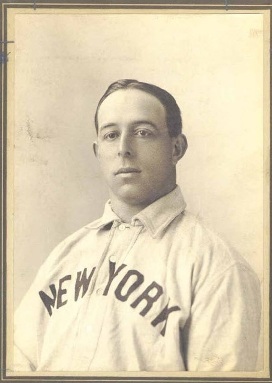 The 31-year-old Dunn had played in 64 games in 1904, batting .309, and finished an 8-year career primarily in the National League. In the second game, the trouble began in the first inning when Dunn “should have made a home run on a ball that took a lucky bound over the right fielder’s head, but he was declared out for not touching the first base.”6 Marshall argued the call and was ejected by umpire Jim Johnstone. That’s when the riot started. Fans “jumped onto the diamond and made a rush for the official.”8 On his way to the dressing room,9 Johnstone was knocked down by one spectator, where “the infuriated Giants’ partisans started to kick and punch him.”10 The police had to rescue Johnstone. 1 Four days after this scheduled doubleheader, the Giants played and defeated the Brooklyn Superbas in Brooklyn’s Washington Park on October 8, 1904, in their final game of the season. 2 “New Yorks Forfeit Second Game of Double Header to St. Louis,” New York Times, October 5, 1904: 6. 4 John Saccoman, “John T. Brush,” SABR BioProject, sabr.org/bioproj/person/a46ef165. 7 Both baseball-reference.com and retrosheet.org list the score of the forfeit as 0-0, but the newspapers printed the score as 9-0. This was a default score when a game was forfeited. 8 “Johnstone Mobbed,” Cincinnati Enquirer, October 5, 1904: 4. 9 David W. Anderson, “Jim Johnstone,” sabr.org/bioproj/person/e51cb9e8. 12 “Giants Forfeit a Game: Disgraceful Windup of the Season on the Polo Grounds,” Brooklyn Daily Eagle, October 5, 1905: 12.